Burnley’s points return since Boxing Day can only be bettered by three clubs in the Premier League, and Charlie Taylor insists that’s a sign of growth. 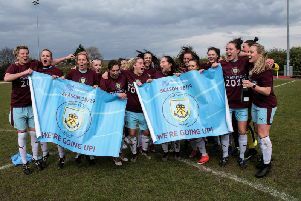 The Clarets have taken 27 points from 15 games in the top flight, an achievement eclipsed only by title contenders Manchester City (39) and Liverpool (34) as well as Manchester United (32). That record has lifted Sean Dyche’s side clear of trouble and their status at this level could be rubber-stamped before another ball is kicked on Easter Monday. Following victory over Cardiff City at the weekend, Taylor said: “It’s huge. It’s so nice to look at the table and see us so far away from the drop zone with a lot of points on the board. “It takes the pressure off us now with four really tough games to go, but he [Dyche] won’t let us rest on our laurels so we go again and keep climbing that table. Taylor added: “I think after the Everton game that was a real eye-opener, and we knew that if we didn’t sort it out, then we’d be in real trouble. “It was in our hands and we’ve done that. The second half of the season our form has been up there with the best in this league. “Finishing seventh was a huge achievement last year but, at the same time, I think from where we were at Christmas, this season is just as good an achievement for what we’ve done in the second half of the season. The Clarets have also scored more goals than 16 clubs in the Premier League since that defeat at home to Everton during the Christmas period, disspelling the myth that the squad lacks a creative impetus. Burnley have scored 25 times in that spell, just one short of the Red Devils, and have conceded fewer goals than over half the league. Those statistics are a far cry from those that plagued the table in the first half of the season when they’d taken 12 points, scored 17 goals and shipped 41. Despite the run of games, where they take on Chelsea, Manchester City, Everton and Arsenal, Taylor is confident that the club can continue adding to that. The defender said: “We knew weren’t good enough in the first half of the season for whatever reason. “We didn’t want to use excuses such as Europe or whatever but we knew we had to put that right or we’d be in a bad situation. “It’s a good time for the club. With whatever will happen over the summer we’ll get stronger and I think everyone is looking forward to next season. “We have to finish this season off obviously but next season is looking good and if we can carry this form on that will be brilliant.